This article examines the problem of formation of linguistic and regional competence of foreign students. Linguistic and regional competence includes three components: regional background knowledge, regional and cultural vocabulary, linguistic and regional skills. The result of formation of this competence is a successful communication within the limits of the social and cultural space of the region of residence. 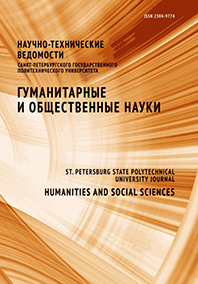 We analyze linguistic and regional competence of foreign students, living in St. Petersburg, on the basis of experimental research.